The 28th and final Kansas Sampler Festival was held May 6-7, 2017, in Winfield, Kan. The festival was held in Island Park which was a beautiful setting with lots of big trees, green grass, a huge children’s playground, geese and nice paved roads around the park. The island is like a castle surrounded by a moat except it’s a river that flows around it. Osage City was in the Northeast Kansas tent along with a dozen other booths set up by representatives from cities and counties in the northeast Kansas area. Early on Saturday morning, flags from participating groups were paraded to the main meeting area for the traditional opening ceremony. The festival opened to the public at 10 a.m. and the first of many attendees began filing through the tents. Osage City was represented by Julie Carlson, Jan Williams, Wayne White, and Dave and Tara Azwell. Folks from many areas of the state were provided information about Osage City by a display of banners, informational signs, person-to-person contact, brochures, flyers and county guides. 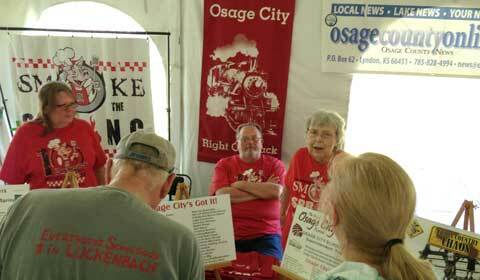 Red and blue Osage City tote bags were handed out and could be seen all over the park as the day went on. 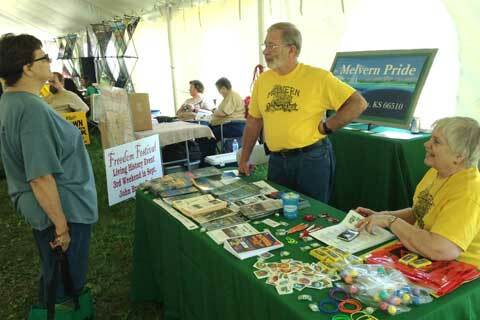 Other Osage County communities on display in the Northeast Kansas tent were Arvonia and Melvern. Sunday was about like Saturday with many people passing through the tent. A final count of attendees will be formally announced at a later date. Winfield did an excellent job of hosting the Kansas Sampler Festival for the last two years. Next year will feature a new outreach program to replace the Kansas Sampler Festival. “The Big Road Show” will emphasize county by county exploration during the upcoming years. Each year several county hosts will provide county information and events that people of Kansas will be encouraged to attend. More information on the Big Road Show will be forthcoming. Melvern’s Yocums talk to visitors at the Kansas Sampler Festival. 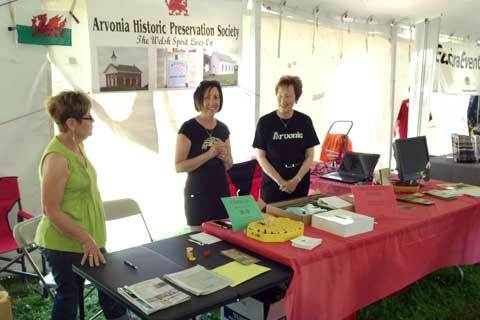 Historic Arvonia continues its revival at Kansas Sampler Festival. 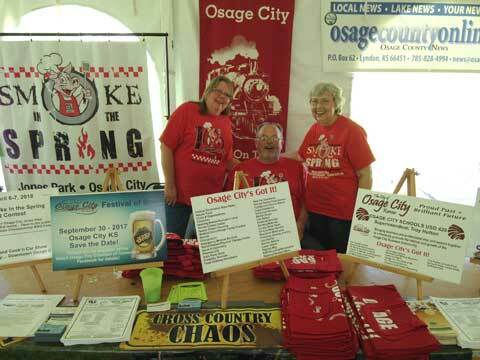 Jan Williams and Dave and Tara Azwell at the Osage City booth at the Kansas Sampler Festival.